While the number of patients using medical marijuana increases every year, misconceptions about cannabis and whether it’s harmful or dangerous still exist. In Cannabis for Chronic Pain, Dr. Rav explains cannabis’s potential capacity for healing anyone afflicted with chronic pain. Medical marijuana is a safe, non-addictive alternative to dangerous opiate pain pills. Along with sharing his own story of using medical marijuana to heal from a severe case of shingles, Dr. Rav guides you through the cannabis and holistic treatment for your specific chronic pain condition. If you are suffering from arthritis, back pain, migraines, fibromyalgia, menstrual cramps, IBS, Crohn’s Disease, anxiety, depression, or pain from cancer or its treatment (etc. )—this book is for you. Dr. Rav offers step by step instruction on the benefits and appropriate use of medical marijuana. And he dispels many of the misconceptions. Did you know that you don’t have to smoke or eat cannabis for it to be effective? There are now vaporizers, patches and drops. We are entering a new age of acceptance and perhaps most importantly, it is now possible to create a distinct cannabis prescription for different types of chronic pain. Fully Alive: Getting High on Life! The energy conveyed by cannabis is both medicinal and mystical, which is most evident with its impact on the heart. Parts I and II have provided you with a wealth of information of the use of cannabis as a medicine, primarily for physical pain relief. In Part III you learn to apply the mystical heart chakra-opening properties of the herb to heal the deeper emotional and spiritual pain underlying all physical pain. While the number of patients using medical marijuana increases every year, misconceptions about cannabis and whether its harmful or dangerous still exist. In Cannabis for Chronic Pain, Dr. Rav explains the potential of marijuanas capacity for healing anyone afflicted with chronic pain. Medical marijuana is a safe, non-addictive alternative to dangerous opiate pain pills. Without a doubt, there is a great need for a reliable source on information regarding the safe and effective use of cannabis. Well, here it is. I can think of no other person who embodies such authority than Dr. Ivker, (Michael Finkelstein, MD, FACP, ABIHM, author of Slow Medicine). Along with sharing his own story of using medical marijuana to heal from a severe case of shingles, Dr. Rav guides you through the cannabis and holistic treatment for your specific chronic pain condition. If you are suffering from arthritis, back pain, migraines, fibromyalgia, menstrual cramps, IBS, Crohns Disease, anxiety, depression, or pain from cancer or its treatment, this may be the book for you. 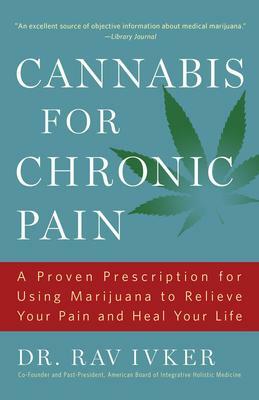 "An excellent source of objective information about medical marijuana, (Library Journal), Cannabis for Chronic Pain is the new, definitive guide for anyone who suffers from chronic pain.